Two films have opened as of late which have disaster in common. One falls into that genre and one almost is one. Unfortunately, this tiny fraction of the movie only really ended up serving one purpose: it clearly reminded the audience of the earlier version, and not to the benefit of the present one, and only went to show how bland and uninteresting the music is when it comes to James Horner and Simon Franklin’s score for this Western remake of a remake (yes, it apparently took two people to come up with something so dull). The new The Magnificent Seven is not as good as the 1960 version, which itself, though fun and entertaining, is not as good as its source material, Akira Kurosawa’s The Seven Samurai. It’s actually not even quite as good as the third version of the story (except, of course, in the technical area), Battle Beyond The Stars, a sci-fi twist from the Roger Corman factory with George Peppard, Robert Vaughn (repeating the role he played in the earlier Western) and Richard Thomas, with a screenplay co-written by John Sayles. The plot is fairly simple. A small town of farmers are being threatened by a robber baron who wants their land for the gold. Though the city has no wealth, they still manage to hire a group of seven gunman to help defend them from being taken over. 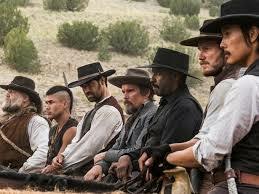 Though The Magnificent Seven has a multitude of beautifully shot vistas in the background overpowering the characters in the fore, that’s about all it has. There’s almost no character, much less character development, and the dialogue is little more than efficient. The result is that when the final battle comes, though the great cost of human life does have an emotional impact, the individual deaths of the seven have none. They never really come alive in such a way that we feel devastated when they die. And the final shootout, though well staged, is one of those where the number of people involved seem somewhat arbitrary such that when the battle is one where no one should come out of it alive, somehow a few stragglers got through. And instead of filling us with admiration for these settlers not willing to give up their farms, with all the death and devastation, one actually thinks, “Maybe you guys would have been better off taking the $20.00 offered instead”. The victory feels somewhat pyrrhic. The seven are played by Denzel Washington, Chris Pratt, Ethan Hawke, Vincent D’Onofrio, Byung-hun Lee, Manuel Garcia-Rulfo, and Martin Sensmeier. They all do what they can, but the only one who really comes off well is Sensmeier, the character with almost no lines. 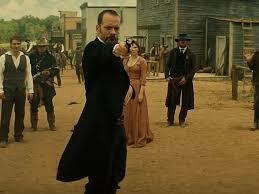 Also with Peter Sarsgaard as the bad guy. He tries even harder than the rest of them, but he doesn’t come off any better. Written by Richard Wenk and Nic Pizzolatto and directed by Antoine Fuqua. 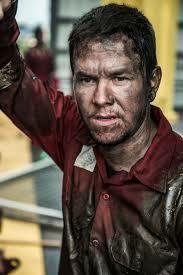 The new film Deepwater Horizon actually has many aspects in common with The Magnificent Seven. The main characters are working class. And the main enemy is big business who considers profits more important than the lives of their workers. And like The Magnificent Seven, it has an epic showdown at the end as people battle for their lives. But while The Magnificent Seven can get almost nothing right, Deepwater Horizon gets just about everything so right, it’s one of the best films of the year. What he does have is incredible instincts. He knows what sort of role will fit him perfectly (usually someone from a working class background who is as tough as his Boston accent). Perhaps the only thing he’s better at than picking roles is producing. He has almost unerring instinct when it comes to his taste in movies and television. 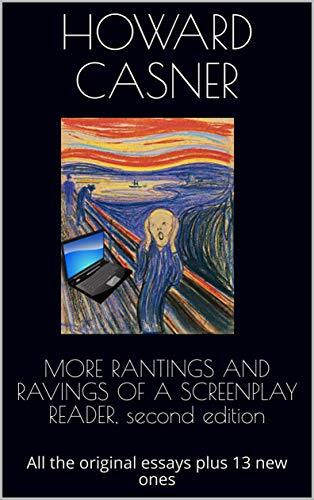 He may not make art films, but he knows what he and the public likes (he has been more chancy when it comes to television in producing such series as Entourage and Boardwalk Empire). 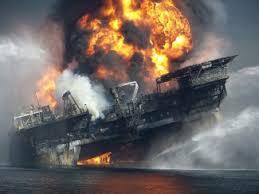 Deepwater Horizon is based on the true story of the British Petroleum disaster at an oil rig in the Gulf resorting in loss of life and gallons and gallons and gallons and gallons of oil spilt on the water. Walberg plays Mike Williams, set to head out to the rig for three weeks; he’s sort of the general handyman there. Williams is a pretty average guy’s guy. He has a wife and child he loves deeply, is somewhat religious and takes life as it comes. Once on the rig, it’s revealed that not all the tests for safety have been held (nixed by BP because they are 43 days behind schedule). It’s decided to drill anyway and things go terribly, terribly wrong as the oil comes gushing out of the ground when it’s not supposed to and the rig catches fire. The screenplay is by Matthew Michael Carnahan and Matthew Sand and it has some of the most amazing and realistic working class dialog I’ve heard in some time. These are just people and they talk about their families, cars, what’s going on in their lives, etc., but the lines have an almost poetic realism to them. Nothing’s rushed and everything feels natural. The acting is rich and convincing. When Kurt Russell started out, he was a child star. He then became a solid leading man, nothing great, but dependable and fun (especially in such cult films as The Thing). But as of late, he’s become an amazing character actor who at times takes over any scene he is in (Furious 7 and The Hateful Eight). He plays Jimmy Harrell (or Mr. Jimmy as he prefers to be called) who is in charge of the rig and you can see all the tension and stress etched into his face. His main antagonist is Vidrine, who answers to BP and wants to get the drilling going no matter the cost. 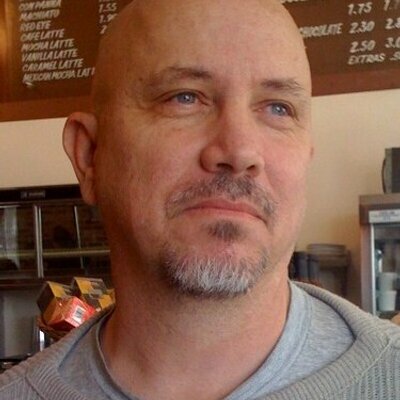 He’s superbly played by an almost unrecognizable John Malcovich with a trace of a Cajun accent. The rest of the cast is vibrantly written and expertly played. And because of this, when disaster strikes, the film achieves something The Magnificent Seven doesn’t. The characters are so real and the acting so rich, you are incredibly and deeply emotionally invested in their lives such that the suspense at the end is almost too much to bear. The final scenes on the rig as everyone tries to survive are expertly done. 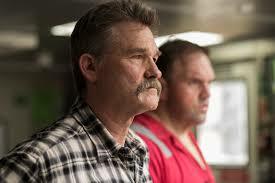 Unlike TMS, where it was difficult at times to keep track of who was who and what exactly was happening, Deepwater Horizon has been so carefully crafted and directed (by Peter Berg) and brilliantly edited (by Gabriel Fleming and Colby Parker, Jr.), you always know what is occurring and what has to be done for the people to survive. With stirring music and thrilling drumbeats by Steve Jablonsky.